Tired of waking up every morning and finding that your air mattress has completely sagged out? Well, you aren’t alone. 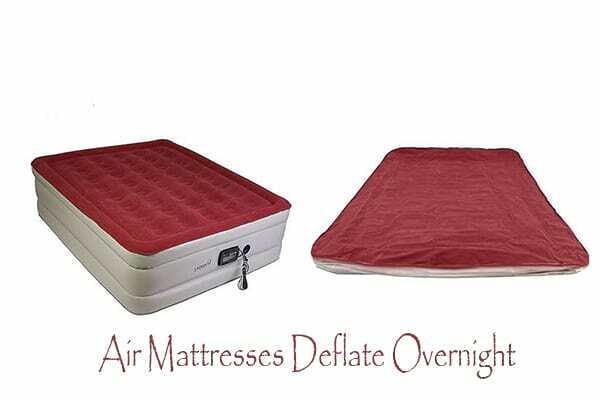 Many air mattresses users are perplexed by the fact with their air mattress losing air but no hole (deflate overnight) even when they had filled them to capacity the night before. This can be quite frustrating especially if you have visitors using your air mattress for the very first time. But unfortunately, air mattresses deflate overnight. The truth is, air mattresses are some of the most comfortable sleeping options that any family has today. Even so, they are so delicate and require the best care if you have to ensure that they serve you well and also lasts longer. For your best mattress to deflate overnight, there are many explanations to that. Here are some top-rated reasons why it deflates overnight. You just bought your air mattress and with excitement boiling, the last thing you want to do is waste your time reading through a boring user manual – in any case, you have read so many expert air mattress reviews before – this is wrong! By disregarding the steps that your air mattress manufacturer has given you, you are giving your bed the best reason for not operating properly. Reviews highlight on general precautions and not specific brands. So do the best thing and take your time to go through the user manual. Make sure you understand every step on how to use your air mattress properly and keep in mind that you follow every one of them all through. By doing so, we can guarantee that you will have your mattress operating at the optimum level. Unless you are keen enough to catch the hissing sound of leaking air as you pump your air mattress for the night, you will have a very uncomfortable sleep through the night. It shouldn’t even surprise you when you find yourself flat out on the floor the next morning. Air mattresses are made from materials that are quite susceptible to leaks, sharp objects, punctures, and ruptures. The best way to save your mattress especially if you use it often is to go for a flocked mattress or a mattress with the extra thick layer under and over it. New mattresses will also feel like they have deflated over the night. Well, this is never the case. What actually happens is that the mattress actually auto adjusts as the material stretches out to get into shape. They will rig in the air and stretch out a little bit before getting into their comfort zone. Even better, this auto adjusting can be easily fixed by adding some air until the mattress gets into shape. Make sure you don’t over inflate the mattress since this can also cause damages that may easily rob you of your favorite mattress. House temperatures during the night tend to be cooler than along the day. This means that if you had a fully inflated air mattress during the day, the temps will drop during the night and the air inside your mattress will also shrink (condense) and leave you with a drooping air mattress. In order to stop your air mattress from losing air but no hole, you can look for an automatic self-inflating air mattress. Such a mattress will re-fill itself to capacity anytime there is a sag in the air pressure. This should be great for people with health needs. External pumps (electric and manual), when used on an air mattress, will often release some air upon disconnection or release. You may not realize this from the moment that you have disconnected the pump. However, it will come back to haunt you along the night as you sleep and when the air inside your mattress also shrinks. The two combinations will easily lead to a sagging air mattress in no time. Thanks to the new mattress designs with built-in pumps, this problem has now been solved for new users. This is the cardinal rule. You want your air mattress to lie in a hazard-free area. Make sure the area where you lay your mattress or blow up your mattress is free from a number of sharp objects including stones, pebbles, broken glasses, and needs. Additionally, you should ensure that the room is big enough for the mattress to fit in comfortably. Keep an eye out for sharp-edged cabinets, chair, and other forms of broken furniture so you minimize any chances of damages. Certain mattresses have been designed by mechanics that allow them to self-inflate to capacity anytime low pressure is sensed. 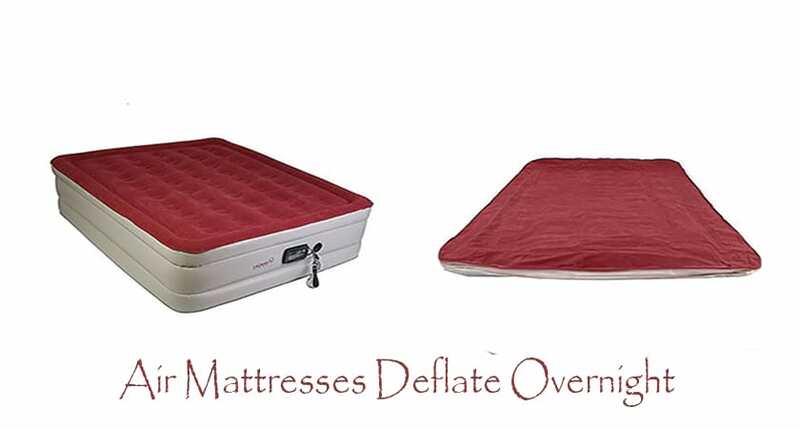 They may worth a little bit more, but sure as hell, these mattresses are some of the best ones that you can lay hands on if you are suffering from health conditions that require you to find best ways of how to prevent air mattress from deflating overnight. If your air mattress is still new, you will realize that it will sag pretty fast. Well, that’s natural. Any air mattress and especially the new ones need some time to stretch out and get into shape. Therefore as the mattress stretches out you should really be patient with it. Allow it to get to shape. As a fact, it is just your air mattress exploding into its comfort zone and not necessarily the fact that it has lost any air. Just remember that depending on your brand, your mattress could expand more or less. Within your first few nights, the mattress will sunken a bit. This is the major cause of air mattress deflate overnight. However, it is just a natural stretch out like we have seen above. To minimize the effect, you can inflate the mattress and leave it to lie around for a day or two without adding any form of weight on top of it. Think about it like this, how would you feel if you carried a weight that you can’t sustain? What will happen next if the weight was suspended above your shoulder? The air mattresses are also like that. They are designed with the specified maximum weight capacity that they can hold. When this capacity is exceeded, your air bed will sink, leak, or damage its seals. To get the weight capacity of your air mattress, make sure that you contact your manufacturer or find your user manual to counter check. When cleaning your mattress, you should ensure that you do it with a lot of care. Lay your mattress in an open space. Make sure the space is also clean and free of any hazards. Use a microfiber rag to clean your mattress. Use the right amount of detergent. Do not overstretch the seams of the mattress. Don’t use brushes to remove stubborn stains. This will ensure that your mattress remains free of leakages when you choose to use it at night. By observing each and every one of these mattress cleaning tips, you not only lengthen the lifespan of your air mattress, but you also get the value for your money. Leaving air in your mattress throughout the day and night might also affect the firmness of your mattress during the night. It has three main effects on the mattress. During the day, the air in the mattress heats up and expands the mattress. At night it shrinks and leaves the mattress feeling really flaccid. Additionally, it also expands the seams of the mattress and causes faster wear and tear. The best thing to do therefore is to only inflate your air mattress when you want to use it. Keep your air mattress folded and kept when it isn’t in use – more specifically during the day. Better still, if you have to leave it through the day, you should learn to release some air and later inflate to capacity before use. This should easily solve this problem easily too. While inflating your mattress just before you lie on it, you should also pay any attention to any signs of air loss. Train your ear for any forms of hissing sounds that might denote the loss of air from your mattress. This will help you to arrest the situation before you lay on your mattress too. Keeping the pressure of your air mattress at the same level as your room temperature will easily ensure a cool balance for both. 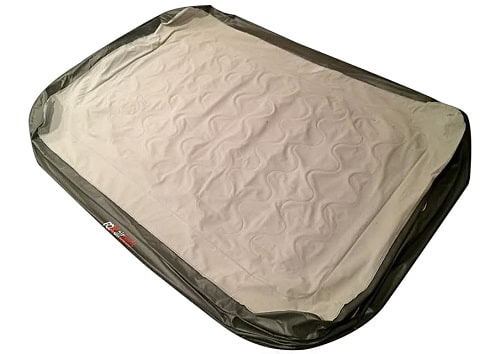 This will prevent your air mattress losing air and also from expanding out of shape. You will easily have a firm mattress throughout the night by just doing this alone. The truth is that all air mattresses will lose pressure at some moment in time. However, every mattress is designed in such a way that it will handle this problem differently. That’s why it is advisable that you take your time to read through the user manual so that you can have the very best experience with your mattress. One of the key things that will play a huge role in this is the weight of your body and possibly the elevation of your air mattress. So keep an open mind on our tips and have the best experience with your air mattress.